In a medium saucepan over medium high heat, bring vinegar, ketchup, brown sugar, lemons, ground mustard, garlic powder, cayenne pepper, salt and pepper to a boil. Lower heat to low and simmer for 1 hour or until desired thickness. The longer the sauce simmers, the thicker it will get. Roast pork shoulder on a baking sheet or roasting pan for 3 hours, or until 170 degrees. Remove from oven and let sit for 20 minutes. Preheat smoker to 210 degrees F.
Place shoulder in smoker and roast for about 10 hours or until meat temperature reaches 170 degrees. Remove from smoker and let sit for 20 minutes. Pull pork apart with fork or loosely chop. 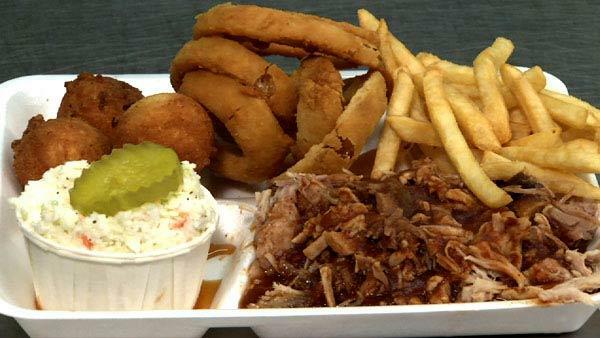 Pour sauce over pork and serve with your favorite sides of hush puppies, slaw, onion rings, or fries.